The Truth About HGH Sprays! Some competitors who sell the HGH pill products (that go through the digestive tract) use the fact that the HGH injections must be injected as a chance to claim that sprays that contain homeopathic human growth hormone are not effective. Those making this claim fail to mention that their pill products are deemed dietary supplements by the FDA and are regulated by their food laws, while our homeopathic HGH sprays are deemed homeopathic medicines and so are regulated by their drug laws. Obviously the FDA does take our sprays seriously since they categorize and regulate them as medicines. 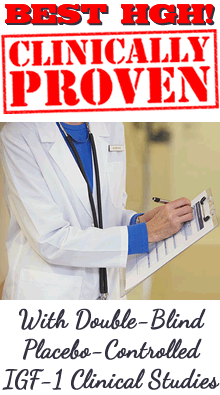 Each of our products has been awarded its own NDC (national drug code) number by the FDA. Competitors probably make the claim that sprays don't work because they think most people do not understand how homeopathy works and so they use this to their benefit to help them sell their own pill or powder products that contain a few amino acids such as arginine and glutamine, and vitamins such as the B vitamins. The pharmaceutical human growth hormone molecule itself is indeed too large to be absorbed under the tongue. In fact as far as we know this web site was the first to state this fact back in 1999. If you placed a dose of HGH injection under your tongue it would not be effective, but this is not what you do when you use a homeopathic spray. Homeopathic sprays work because during the very involved homeopathic process the electromagnetic energies of the growth hormone molecules are transferred into the water lattice of the base solution and so the solution itself becomes potentiated by the HGH. This potentiated solution is then absorbed under the tongue successfully. More information about how homeopathy works can be found in the links below. Competitors also like to claim that homeopathic sprays don't contain enough human growth hormone. Those who make this claim are really just showing how little they know about homeopathy, or else they assume their customers don't understand how homeopathy works and so they will believe this false claim. Homeopathy is based upon helping the body to heal itself using homeopathic potencies of the active ingredient. Homeopathic sprays are not meant to be a full hormone replacement therapy and deliver all the growth hormone the body needs because this will shut down the pituitary gland's own release of HGH. 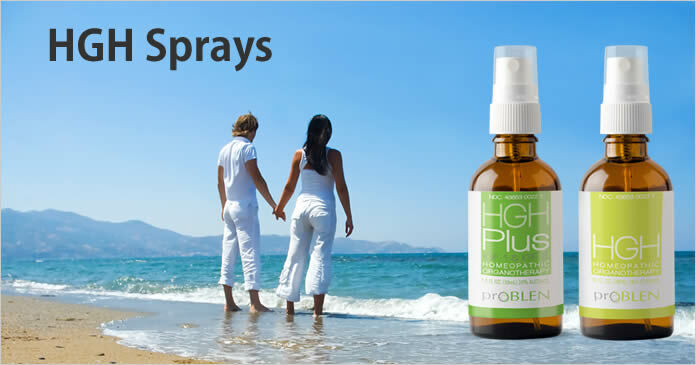 Effective sprays contain HGH that has gone through the homeopathic process, along with organotherapy. Besides delivering homeopathic human growth hormone proper homeopathic sprays help the pituitary gland to release the rest of the HGH the body needs to heal and optimize itself. Those who claim sprays do not work ignore the fact that homeopathic HGH sprays have raised IGF-1 levels the highest of any non-prescription product in independent randomized double-blind placebo IGF-1 clinical studies. IGF-1 blood tests are used to measure the amount of growth hormone in the body. The old claim that alternative medicines are not effective is nothing new in the U.S. There have always been those who deny the value of anything that is different from what they are familiar with regardless of the clinical studies proving effectiveness. Up until recently many physicians had the opinion that taking a daily multivitamin was a waste of money. Only now after years of research and clinical studies proving the opposite some are finally admitting that everyone needs to take a daily multivitamin. Not only has homeopathy itself been proven effective over the past 200+ years with volumes of clinical studies, some homeopathic human growth hormone sprays have undergone IGF-1 clinical studies to measure effectiveness. See the independent double-blind placebo IGF-1 clinical studies done on our own formula. Our clinical results are the best ever independently obtained with a non-prescription product. Thankfully, more and more health professionals are now using and incorporating homeopathy into their own medical practice due to overwhelming evidence supporting efficacy and due to its safety. Some sellers claim their spray product is not homeopathic but is instead exactly like the injections and can deliver all the human growth hormone the body needs under the tongue. This is absolutely not true. Again, due to the large size of the HGH molecule all spray products must be homeopathic if they are going to be effective, yet whether their spray has gone through the homeopathic process or not it still can only contain homeopathic amounts of HGH. Medical professionals and scientists who are knowledgeable in the area of hormones and large protein molecules know that an HRT (hormone replacement therapy) amount of molecular growth hormone must be injected due to the size of the molecule and would also require a prescription and so of course these professionals would say that a spray product such as this wouldn't work. I believe this false claim being used by some is the main reason why some assume HGH sprays don't work. Unfortunately their false claims can reflect negatively and unfairly upon legitimate and effective homeopathic sprays. The HGH Nanogram (ng) Scam! High quality U.S. made homeopathic sprays that contain homeopathic human growth hormone are the smart choice because they can provide benefits safely. They will not overstimulate or burn out the pituitary gland and they won't cause side effects or make the pituitary gland lazy. Dr. Howard Davis states in his book Feeling Younger With Homeopathic HGH that Mr. Howard Turney took the injections for 8 years. Mr. Turney was actually known as the "father of human growth hormone" because he opened the first clinics with growth hormone as the primary treatment for aging. Mr. Turney and his wife took homeopathic HGH spray for years and he told Dr. Davis they received the same benefits they received with injections (see the book by Dr. Davis). Homeopathic HGH - the Smart Choice!